Anyone seen a flat artifact like this? Has anyone seen a circular ring like the attached image? The hardware is a C14 classic with long dew shield, Optec-compressed 0.5X ST8XME. The light source is a white t-shirt stretched on a plywood board immuminated on the sides by two incandescent bulbs. I have had good flat with this setup in years past. I does it with or without the t-shirt or dew shield. Did you recently add the 0.5x compressor? Looks like your F.O.V. got to big for the hole in the plywood. It looks to me like an enlarged pupil image, much like the dust donut you see in the lower right. My guess is that it is a ghost reflection in your system, probably after the flat light reflects off of the sensor or its cover glass and then bounces off of some surface and back down to the sensor. You might be able to check this by putting a string from the center secondary holder to one edge (that is, placing something close to the correct that is asymmetric; you can use anything you want, just put it close to the secondary since its image seems to occupy most of the sensor).  In the resultant image, you should see the string if what we see is the telescope pupil. Then the trick will be to find where the ghost image is coming from, and why it has suddenly appeared. I assume this artifact is present in all filters? No, the 0.5x compressor is not new. The white plywood is quite oversided (maybe too much so!). Please pardon the delay - was a away for Canadian Thanksgiving! Thanks for the suggestion. It's there to various degrees in different filters. More so in V and R than B and I. I am going to eliminate some things by switching cameras and shooting unfiltered to see if that changes anything. I also just took apart the ST8 and FW to inspect and clean everything. A couple of months ago I had to process images from a friend, something like 70 images of a comet on a star bakground and a not perfectly dark sky, my friend didn't got a flat. After stacking, at my surprise, I got a sky background very similar to your flat. The scope was a C8 SC equiped with a x0.5 focal reducer. A specific issue of SC ? The SC have a long baffle tube from the primary hole towards the secondary and the secondary has a kind of gasket cone. All this play a poor job reducing the enormous diffuse light flux that is produced by a classical flat target near the pupil (undue rays, at an angle in excess of the FOV). There is a huge light flux being diffused directly inside the baffle tube. But the further projection of that diffuse light towards the sensor is then limited by the tube back aperture. Is it not what produce this kind of figure, the central circle, when a focal reducer is used ?